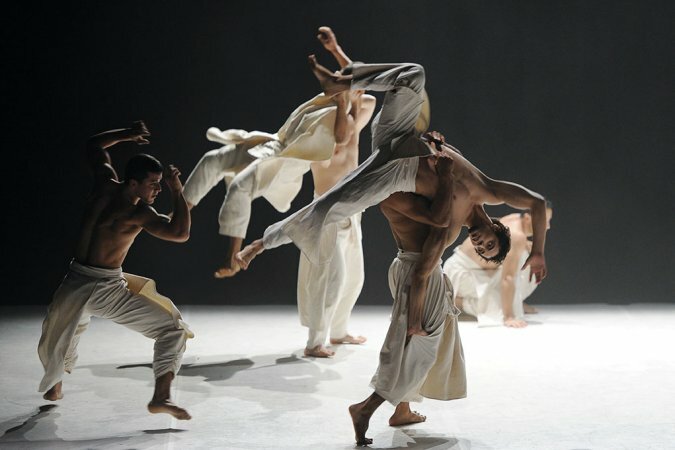 MDC Live Arts, Miami’s most eclectic performing arts series, continues its groundbreaking season, Ojala/ Inshallah: Wishes from the Muslim World, partnering with Olympia Theater to present the breathtaking dance company Cie Herve Koubi in What The Day Owes to the Night at 8pm on Feb. 10 at the Olympia Theater. Cie Hervé Koubi makes its Miami debut with a highly physical, ﬂuid work for 12 French-Algerian and West African male dancers, hailed as a “stunning fusion of acrobatics, gymnastics, b-boying, modern dance and ballet” by the The Washington Post The piece is an exploration of and reconnection to the company director‘s North African roots. The rest is choreographic history. “I went to Algeria to make light in my dark (because unknown) history. I had to give life to my orientalist dreams, I had to do it with dance. I had to do it with dancers from Algeria using their specific skills. The youth of Algeria is like that, full of power, full of dreams also. Our paths crossed and gave forth this unique dance project,” he claims. In addition to admiring their tremendous athletic skill, Koubi was impressed by his dancers’ ability to convey the meaning of this piece. Together with the elements of music, set and costume, they help bridge Koubi’s European upbringing with his roots on the other side of the Mediterranean. Dressed in ﬂowing white, they exude grace and masculinity amid a backdrop of imagery evocative of Orientalist paintings and Islamic architecture, all to a musical score that combines Sufi song and Bach with Nubian composer Hamza El Din and the Kronos Quartet. The result is pure alchemy. Purchase your tickets online at www.olympiatheater.org for this spectacular dance performance on February 10th at Olympia Theater 174 E. Flagler Street, Miami. Miami Dade College’s (MDC) MDC Live Arts, is Miami’s most eclectic performing arts series. Created in 1990 as Cultura del Lobo, MDC Live Arts has a celebrated history of bringing extraordinary national and international performing artists to Miami. The annual series presents today's most exciting artists and designs meaningful engagement between these artists, the students of MDC, and the greater community. MDC Live Arts seeks artists from across the globe who push boundaries and honor traditions relevant to Miami’s diverse community, and aims to offer audiences opportunities to discover new ideas, perspectives and forms of expression.